Note how they characterize the flyers as "Islamophobic" because they "attempt to link Islam with terrorism" – even though nothing in the flyers actually suggests this. Instead, let's look at the accusations in the flyer to see if they are founded. 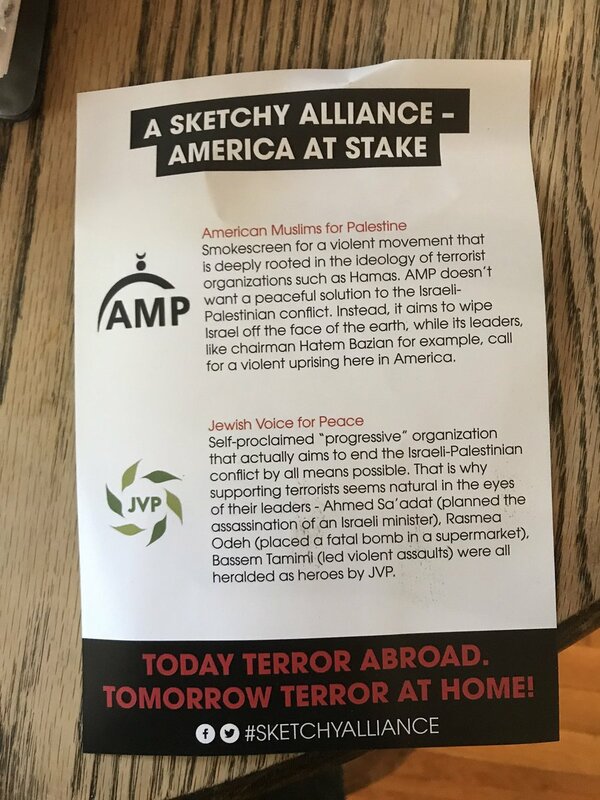 According to the ADL – which incidentally comes out hard against "Islamophobia" – AMP is not only affiliated with terrorists, but is also antisemitic. American Muslims for Palestine (AMP) is the leading organization providing anti-Zionist training and education to students and Muslim community organizations in the country. Founded in 2005, AMP promotes extreme anti-Israel views and has at times provided a platform for anti-Semitism under the guise of educating Americans about "the just cause of Palestine and the rights of self-determination." To mark the start of the 2014-2015 academic year, for example, AMP Chairman and University of California, Berkeley professor Hatem Bazian, announced and promoted an "International Day of Action on College Campuses" to be held on September 23, the day before Rosh Hashana, the Jewish New Year. In March 2013, AMP unveiled a billboard campaign on Metro North stations in suburban New York falsely accusing Israel of "apartheid." The ad, which was announced on the first day of the Jewish holiday of Passover, features the silhouette of an Israeli soldier aiming a gun at a Palestinian child and called for an end to "unconditional American aid for Israel." In March – April 2014, AMP again embarked on an anti-Israel ad campaign on Washington D.C. area bus sides calling for an end to U.S. aid to Israel. The ad ran on a popular tourist route during D.C.'s Cherry Blossom Festival and stated: "We're seating April 15 so Israelis don't have to!" Jamal Said, the imam and director of the Mosque Foundationof Bridgeview, is a frequent speaker and fundraiser for AMP. He was listed as an unindicted co-conspirator in the widely-publicized HLF Hamas financing trial. In 2000, he asked attendees at an Islamic Association for Palestine event to "pay for the family of a martyr." In 2009, he said, "We need to raise our children to know the martyrs of Gaza." During the 2011 AMP conference, AMP board member Osama Abu Irshaid argued that launching rockets from Gaza into Israel cities should be legal, saying "So instead of blaming the victim, we should look at the criminal and the murderer. And instead of blaming the victim that even though if they're firing rockets, regardless, now this is according to the international law should be a legitimate resistance, because they are under occupation." Archbishop Atallah Hanna, the Archbishop of Sebastia from the Greek Orthodox Patriarchate of Jerusalem, was arrested and charged with 'suspicion of relations with terrorist organisations', 'illegally entering an enemy country' (i.e. Syria and Lebanon) and 'incitement' by the Israeli government. As an official speaker at the 2013 annual AMP conference he said, "There are more than 8,000 Palestinian prisoners in the prisons of the Occupation. They are the pick of Palestinian youth, of honorable strugglers, who served the Palestinian cause. They were sentenced to the prisons of the racist Occupation because they defended the cause of their people, because they resisted, because they struggled, because they waged Jihad." Sarah Mufid Abdulqader, daughter of one of the convicted HLF members mentioned above, Mufid Abdulqader, told the 2013 annual AMP conference audience: "It's an honor to have a father that was put in jail", Sarah Abdulqader said, and she asked Allah "to free all political prisoners of Palestine in Palestine and in the United States." In July 2013, AMP National Campus Coordinator Taher Herzallah praised Israeli casualties of Hamas attacks. He posted photos of injured Israeli soldiers on his Facebook and wrote underneath, "The most beautiful site in my eyes." The post was removed after it got attention. The website Hamas on Campus has more on AMP's support for terrorism. AMP Chairman Hatem Bazian did indeed call for a violent uprising in America. There's even video of it. The Muslim Brotherhood has provided the basis for all modern-day Sunni Islamic terrorist organizations such as Hamas, Al Qaeda, and Islamic Jihad. According to Richard Clarke, a former national coordinator for security under Presidents Clinton and Bush, "all of these organizations are descendants of the membership and ideology of the Muslim Brothers." Bazian spoke at a KindHearts fundraising event entitled 'Palestinians in Agony!' in June 2004. In 2006, KindHearts' assets were frozen by the U.S. Department of Treasury for allegedly transmitting money to terrorist organizations. According to the Treasury, KindHearts was trying to replace the Holy Land Foundation for Relief and Development, the main fundraising division of Hamas. While at SFSU in the 1990s, Bazian accused his student newspaper of being full of "Jewish spies." JVP are also one of the organizations endorsing the campaign to free arch terrorist Ahmad Sa'adat. 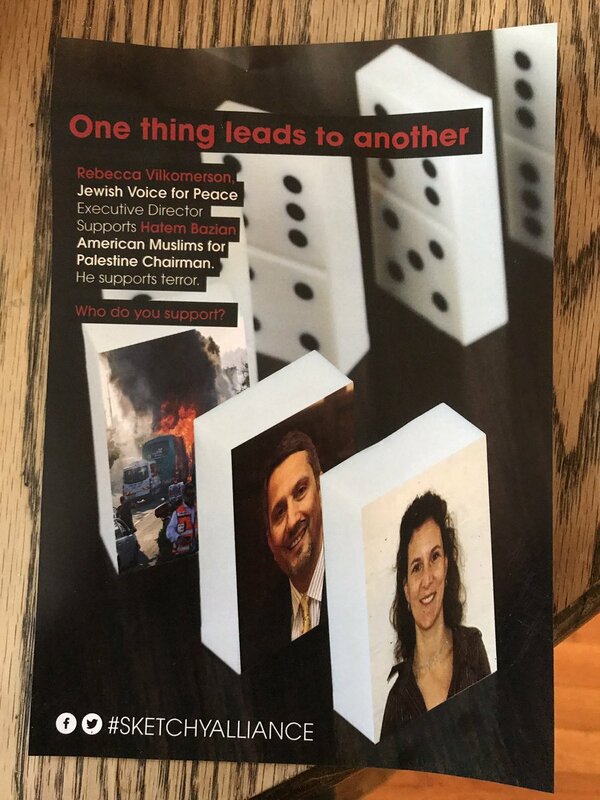 As for Vilkomerson's suggestion these flyers are somehow cowardly, this is coming from the executive director of the organization that not long ago impersonated the New York Times to demonize Israel.